I actually have two finishes to share today, though neither one of them are projects from my Quarter 3 Finish-a-Long list. I think I've finished one thing from that list so far, and there's not much left of this quarter. Oh well, that just means it will be really easy to write the quarter 4 list, right? 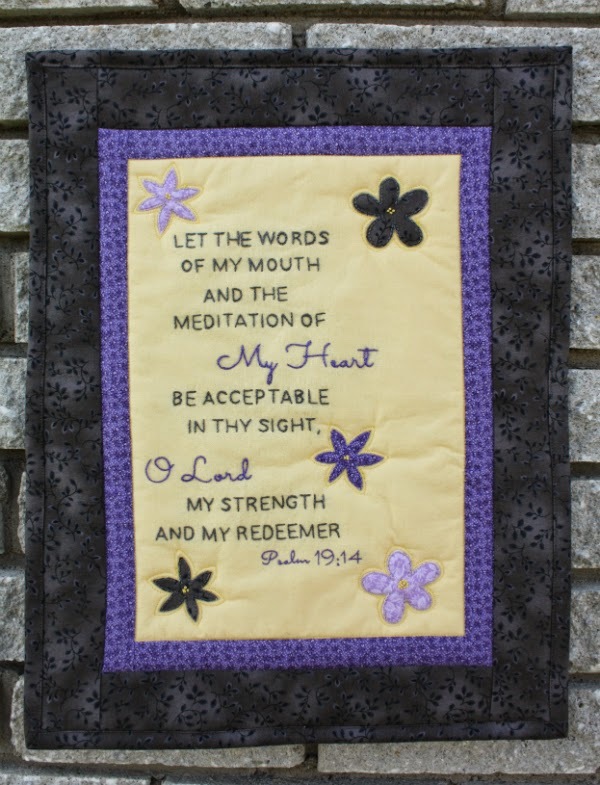 The first of my finishes is the embroidered Psalm 19 wall hanging. I am so pleased with how this turned out! I love the purple script in the midst of the grey words. I used the fast triangles method on the back rather than adding a sleeve. It was my first time doing this and I'll be doing it again for sure. It's so much faster than making a sleeve and then stitching it on by hand. 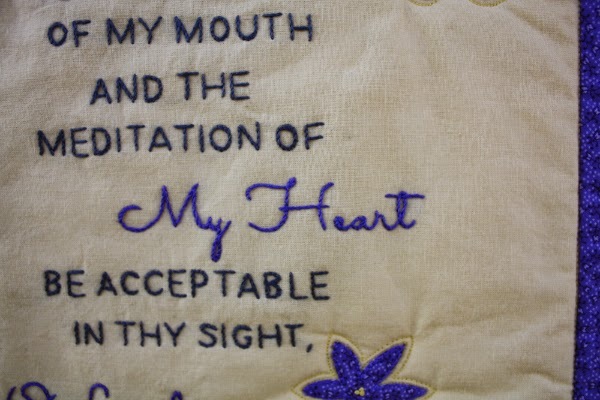 As you can see from the back, I did minimal quilting on this one as I didn't want to detract from the embroidered verse. It doesn't show in any of the pictures, but that binding is nearly perfect. I came across a tip that made a huge difference, but I can't give proper credit for it as I can't remember which blogger shared it. 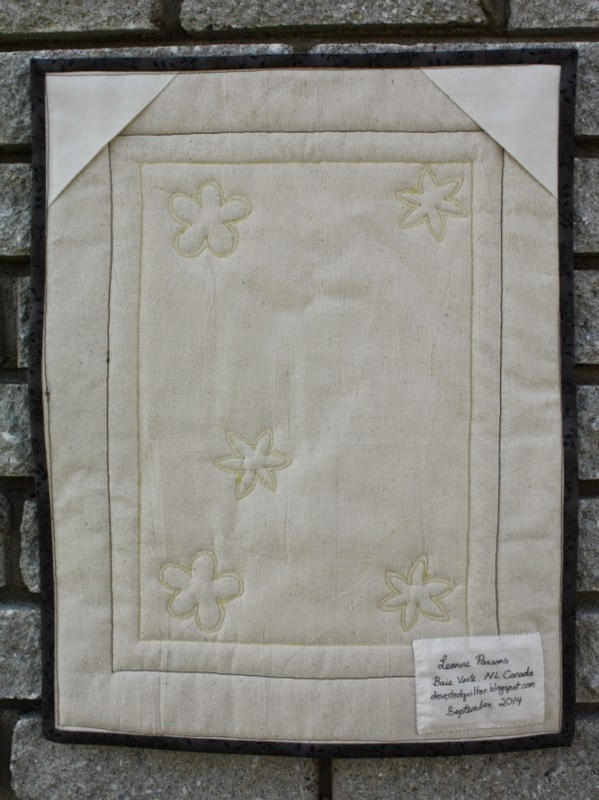 Whoever it was, she said that after she puts her binding on the first side, she irons it up and away from the quilt before folding it over to the other side. I didn't think it would make much difference, but it did!! Such a simple step, but it made the binding look much neater and much more professional. My second finish is a baby blanket with ribbon tags, like the one I made for Maddie last year. This one is for a little boy, and has some heavy machinery in the focus squares. I made it as a test to see how long it takes to make one of these blankets. Turns out it takes 1 1/2 hours from start to finish. I love all the different tags, which are not only different colours, but also different widths and different types of ribbon. Lots of things for some little baby boy to explore. I did simple, straight line quilting on either side of the seams. So, those are my two finishes, and the new project I've started actually involves them both. Devoted Quilter is now a shop on Etsy! It's something I've been thinking about for a long time and I finally took the plunge this week. Both of these quilts are listed there, as are some of my patterns. I'm planning to get more items listed over the next couple of weeks. If you have a shop on Etsy, or if you buy from Etsy, do you have any tips to share with this new shop owner? I'd love any suggestions you may have. Thanks! what great finishes! I love that verse. (such a good idea to have it hanging right in front of you as a remidner!) Love the hanging triangles idea...I need to add those to mine, I hate making sleeves. and I think it might have been on my blog that you read the binding tip. so glad that the pressing tip helped! Congratulations on two finishes, Leanne! I really like the baby blanket with ribbon tags. I have seen how much fun those are for children to explore. Good luck with your Etsy store. 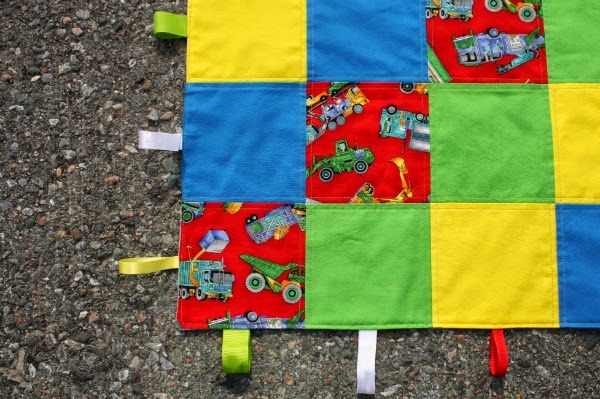 Suggestions I have for Etsy would be to use up all your tag words for any posting (baby quilt, modern baby quilt, baby shower gift, etc etc etc). Be creative and check out your store statistics to see what search words people use to find your store and make sure to use those search words! The more description you can put in a listing the better, and of course, great photography helps pull someone over to your listing. Great finishes!! 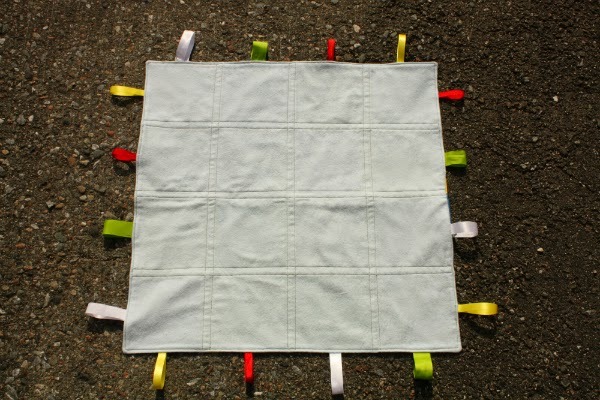 Great idea to put ribbon tags on the baby quilt! Good luck with your etsy store!! great finishes, I love your mini, the verse is wonderful. I wish you the best with your store, and I love your finishes. 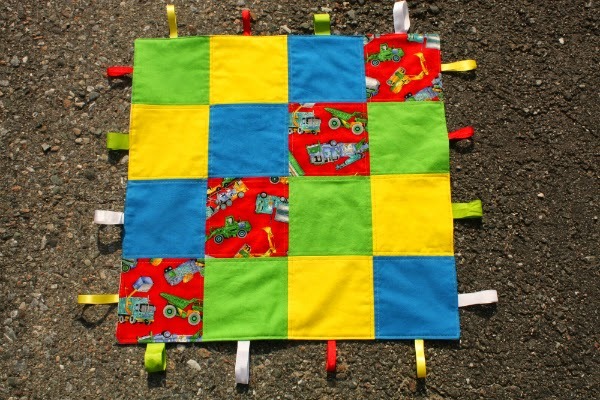 The bright baby quilt is too cute! Congratulations on opening your own shop on Etsy, Leanne! Your finished Bible verse piece is simply gorgeous. The purple really shines with that black floral used for the border. Nice work on the whole thing, but "Yippee!" for a perfect binding, too! Very nice. 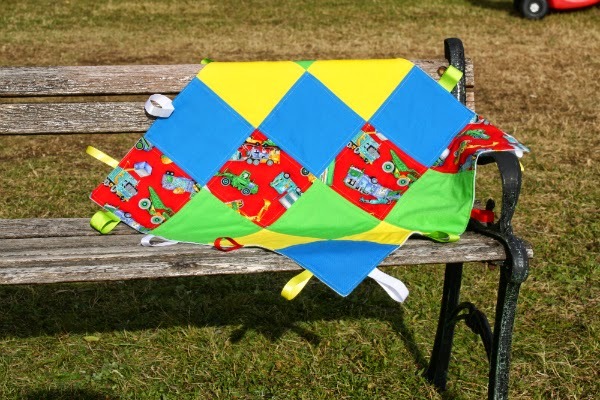 Do you have tutes for the fast triangles and the baby quilt? Love your wall hanging! What a great reminder, Leanne! Thanks for sharing at TGIFF Linky Party!